2016 is here, and if you're like every other work-at-home or small business person I know, your #1 goal for the new year is this: you want to make more money. Whether you need it to pay the bills, or you really just want to see some growth with your business plan, more money will take more clients. More clients require more selling! If you're in direct sales, copywriting, ebay sales, blogging, housecleaning or virtual assisting, you will have to makes some sales this year to keep thing running. 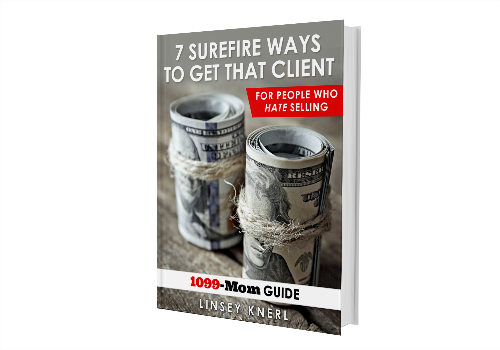 So many of us hate to sell, though, and getting over our fears can be very, very daunting. I'm not a salesperson, and yet, I've grown my business to the point where I can support my family of 8, homeschool, and live a life of freedom on our 4-acre farm. I do this by using specific tips to fill in the gaps where my confidence and social skills fail. I have mastered the use of 7 tools to grow my business and keep things running. I'm ready to share those tools with you! You can read all about my surefire ways to get new clients without having to feel like a salesperson. You can recreate, adapt, and explore these tools to create growth in your own business. Some take just minutes and can be done today! No additional courses or expertise is required to do any of them. 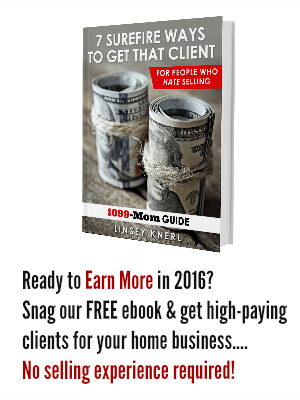 Readers of the 1099Mom community can get this book right now, simply by signing up for our sales and marketing growth updates designed to help you grow your home-based business in 2016. We will never sell or divulge your info to others. You are free to leave the mailing list at any time. Get started and sign up for your ebook below. Once you confirm your subscription, you'll get your book in minutes and can start today!